Monumental sculptures amidst vine rows, what an idea! The “art and vine” tour offers you an innovative blend of contemporary art and fine wines at Château Smith Haut Lafitte. You enjoy wine and art intrigues you; or the other way around. The Château Smith Haut Lafitte invites you to unveil the secrets of its sculptures at the heart of the vineyard. Walking through the rows of cabernet and other iconic grapes of the property, you will discover through interesting anecdotes the reasons behind the presence of these masterpieces in the vines. You can activate a metallic sphere that spreads out like a vine flower transforming into a grape… guaranteed to impress. If rabbits, which feast on young vine shoots, are no winemaker’s friend; the hare which doesn’t eat the vines and scares away the rabbits, is the protector of the vineyard. 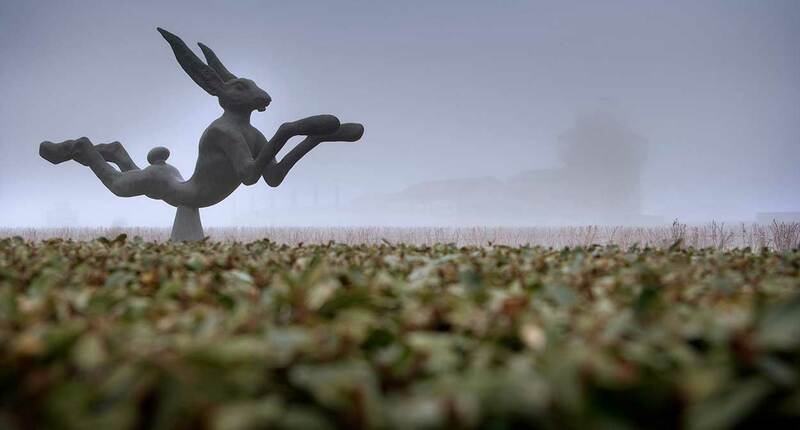 With this iconic animal begins the discovery of the sculptures of the Château: the bronze hare by Barry Flanagan protecting its plot of cabernet. Florence and Daniel year after year adorned their vineyard with magnificent sculptures for intimate reasons and through personal encounters. Caduto a Ragione by Mimmo Paladino was a coup de cœur revelation for Florence who saw in the multitude of birds perched on the slender body of this metallic man, the multitude of wine connoisseurs, merchants and other professionals who come to taste the wines of the Château during the frenetic en primeurs future week. Daniel, on his side, a huge fan of U2, met the engineer, artist and creator of the scenography of the group, Chuck Hoberman, at a concert and asked him to symbolize the nouaison berry setting of the vine with an animated sculpture. You can now activate a metallic sphere that spreads out like a vine flower transforming into a grape… guaranteed to impress. Finally you will have to find out by yourselves some of the other secrets, such as the nickeled bronze crinkled paper by Wang Du in front of the Château cooperage, where they make the wine barrels. Will you discover from which magazine the page comes? Phone : + 33 (0)5 57 83 11 22.